Today we dropped in to see Sandy and to deliver some furniture items that may be useful to him. It has been 9 months since the devastating floods that drowned Sandy’s collection. He is still awaiting the completion of the restoration of his house – the insurance company finally paid up and he did receive funds from the Premiers Flood Relief program to help. The problem is getting tradesmen as they are highly sought after fixing other flooded properties. Despite loosing nearly everything including his extensive photographica collection, computers, printers, workshop equipment and car he is forging ahead with regaining a scaled back collection of photo items that interest and excite him. He talks enthusiastically about new eBay discoveries and the massive additions he has made to his research on early photographers both here in Australia and the United Kingdom. 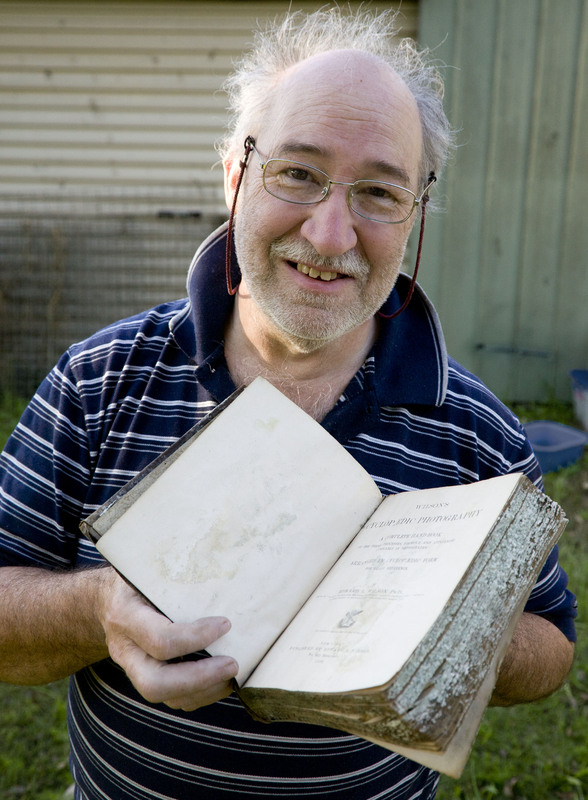 He has the mementos of the past still around him as seen in the photo where he holds a decaying 1890s photo reference book, but somehow his vision is to the future. His observant eye is as sharp as ever enabling him to make connections between photographic stuff that others want to get rid of via eBay, auction and car boot sale, and the provenance that makes these things valuable objects of the past.